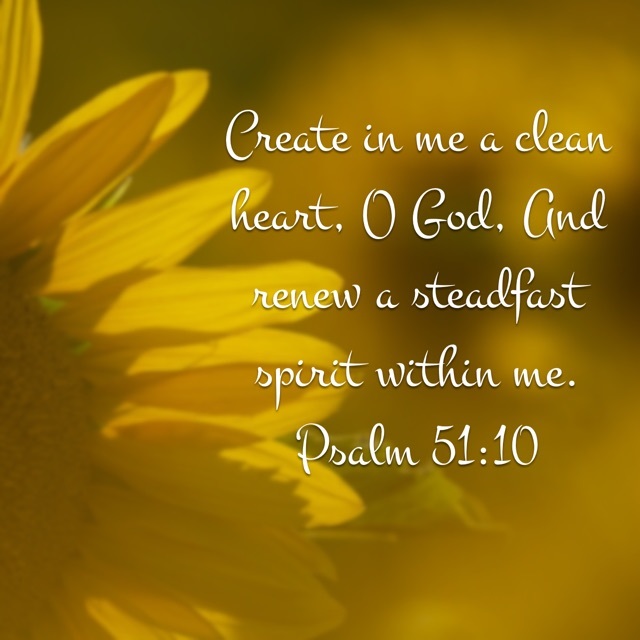 This week's verse is Psalm 51:10. How many times have you heard, "Just follow your heart"? To me, that has to be one of the craziest things to advise someone to do. Every time I've ever "followed my heart," I've ended up in a huge mess. Jeremiah 17:9 says "The heart is deceitful above all things, and desperately wicked: who can know it?" Well, no wonder I end up in a mess when I follow my heart. I would never willingly follow someone who was deceitful and desperately wicked, so I'm not quite sure why I would want to follow my heart. If Jeremiah 17:9 was the only verse about my heart, that would be extremely depressing. Thankfully there's a remedy for my wicked, deceitful heart, and that is Jesus. Ephesians 3:17 says "that Christ may dwell in your hearts by faith." 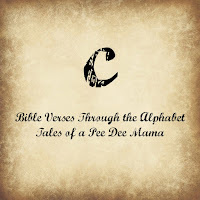 That brings me back to the C verse for my Scripture through the alphabet - a plea for God to create in me a clean heart. If Christ is dwelling in my heart, I want it to be cleaned up. When I have company coming over to my house, I clean, and clean, and clean. I want them to see the best side of me and my home, not the piles of laundry on the couch waiting to be folded or the pieces of dirt and grass on the floor that were tracked in on the bottoms of soccer cleats. Why wouldn't I want to do even more to clean up where Christ isn't just coming to visit, He's dwelling there. He LIVES there - in my heart. The Almighty, Most Holy, Creator of the Universe lives in my heart. 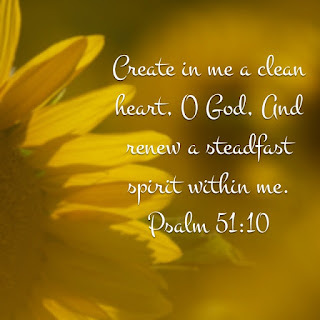 If I clean as much as I can for fellow sinners who come to visit my house, I definitely need God's help to clean up that wicked, deceitful heart of mine . 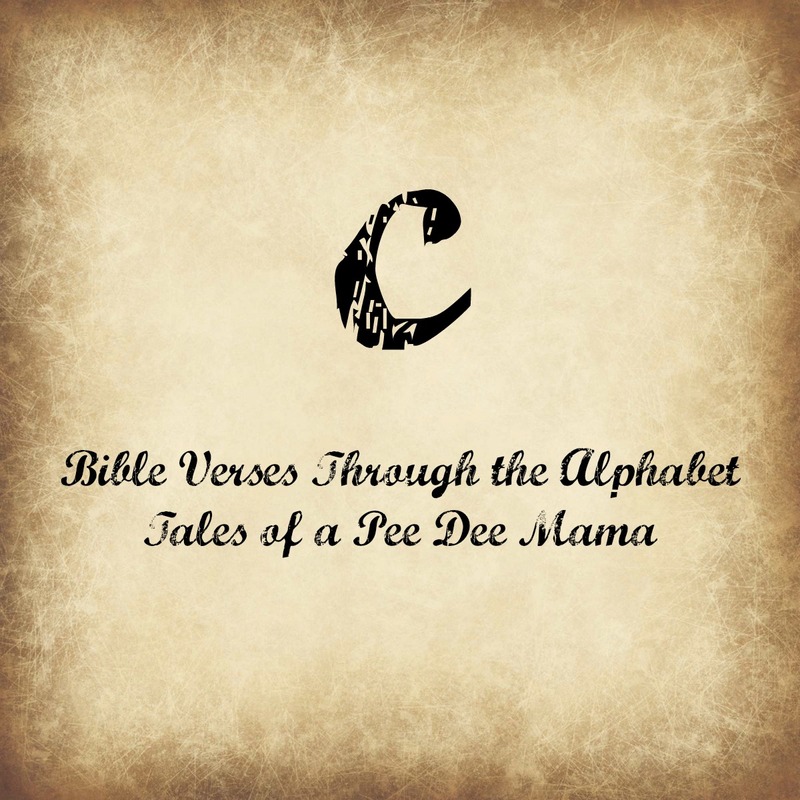 Cleaning up means a lot of prayer - repenting for those things I do each day that I know hurt the Lord, asking for Him to help me to steer clear of temptation, being still so I can hear what He has to say to me. It also means time in my Bible so I can better understand how I should be acting (I fall short so often, but I do try). This is my spiritual housekeeping. Have you done your housekeeping lately?